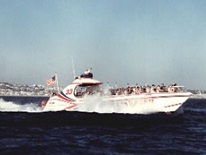 The Ocean Racer Redondo Beach is the West Coast’s largest speedboat- 70ft. The ride is safe, exhilarating and seasick free due to the high tech hull design and speed. Enjoy whipping through the Pacific Ocean as you experience the sights and sounds of the ocean. You will also sea lions and the possibility of dolphins! The Ocean Racer can hold up to 140 passengers!